We had the opportunity to review Chutes and Ladders from Winning Moves. Chutes and Ladders was a favorite of mine growing up. It's very cool I can play this game with my grandson. It's so nostalgic yet I can make new modern memories with him. Winning Moves has an amazing selection of games, and they have added Chutes and Ladders. I believe the artwork on this game is still the same as when I was a child. Does anyone here need a Chutes and Ladders refresher course? Come on over! You climb up the ladders and slide down the Chute. The game allows for 4 players at a time. Players will spin the spinner for a number one through six and with any luck you'll come across a ladder in the amount of spaces you're moving. Up the ladder you go, moving faster to the Top. If you land on a chute though you will have to slide backwards. Chutes and Ladders is an easy game for youngsters to learn, my grandson is in kindergarten and he caught on quickly. He spins the spinner and counts the spaces. Like all children, he's not happy if he doesn't win. We are working on being a good little sport. 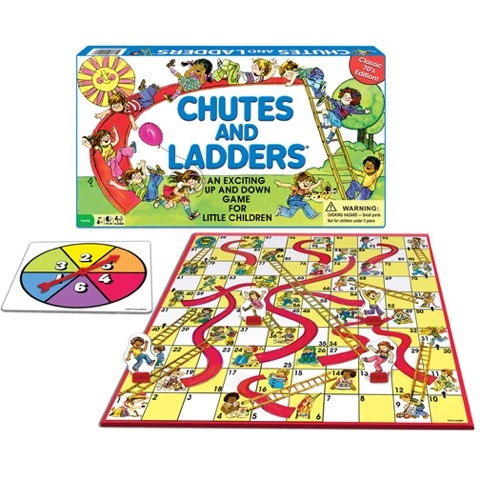 The game Chutes and Ladders helps teach young people sportsmanship. Facebook , @WinningMovesGames , and You Tube , Pinterest , Instagram , , and Their Website . Chutes and Ladders was one of my favorite games when I was a child. I remember playing it for hours with either my friends or my parents! Some games never go out of style!! I'm so glad that these classic games are still available. I love that my kids can enjoy the same games I played as a child.